Actually, this post is dedicated to all of the writers struggling to stay encouraged. Last week, I submitted a short story for a contest. After the submission, I found out that there were some plot issues that should have been fixed. I went from being proud of myself and hopeful, to kicking myself and wanting to cry all in the space of about four hours. Oh well, I chalk it up as a lessons learned: (1) Never try to write a story at the last minute and (2) find the right people who will actually take the time and invest truth and caring to be your beta readers. Even though I won’t win or place high in this contest, I did complete a goal. So today, I celebrated. I went to Starbucks and bought my favorite beverage. But I did something else to encourage me. I went to the Science Fiction section of Barnes and Nobles and located the place on the shelf where, once I have physical books published, my book might appear. 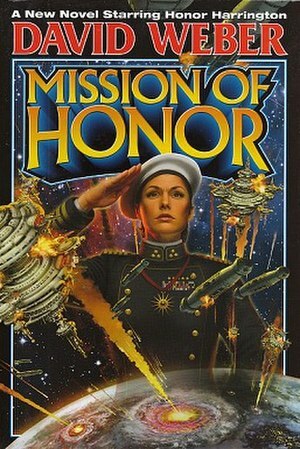 I would be sitting right next to David Weber, author of the Honor Harrington series. Someday I will write well enough that I will be accepted by an agent, then a publishing house and then published. That’s my long-term goal. Self-publishing is in the list of goals as well; however, I am still hopeful for a traditional publishing contract as well. So during those times when I am kicking myself, doubting if I’m talented enough, and wondering about my sanity, I have to make sure I can encourage myself. I can’t always look to others to do it for me. I have to believe in me no matter what. I know that this is what I was meant to do. I can’t not write. My encouragement to you is to set your goals, celebrate them and when you get discouraged, find that ray of light that shines upon you and reminds you that this is your calling. Surround yourself with other writers who will honestly encourage you and refuse to let you give up. But most importantly, believe in yourself. You can do this. You will do this.